Hereford United had two trialists on show during this evening's Cup game at Westfields. One of them, Clayton Fortune (pictured above), had already played for the Bulls in a previous friendly but the other, Ashley Sammonds who was recently released by Birmingham, it was the first time he had been seen. Fortune played alongside Stefan Stam in the heart of defence. Sammonds, above, started in mid-field partnering Will Evans. Meanwhile Dan Connor played for the whole 90 minutes between the sticks. Several of the signed players didn't featured this evening - Luke Graham, Dan Hanford, Marley Watkins, Simon Clist and James Bittner. Two goals either side of half-time by Sam Clucas gave Hereford United victory over Westfields in the HFA Senior Cup Final in front of 592 supporters at Allpay Park. Will Evans lifted a left-foot shot over the bar for the Bulls early on before Dan Connor, starting in the sticks for United, made a smart save to deny Westfield's number 8 with a right-foot strike from the angle. Hereford took the lead on the nineteen minute mark; James McQuilkin fed a pass down the line which Evans raced onto, drawing the home 'keeper Matt Gwynne out before whipping a ball across the box where Clucas slid into direct the ball into the roof of the net. Evans was involved soon after, swivelling well after collecting a Ryan Bowman knock down to fire powerfully at Gwynne. Westfields threatened towards the end of the half, with number 12 sending a rising shot over the bar whilst a Craig Jones corner was fluffed by Connor, but former Bulls' full-back Joel Edwards couldn't get his header on target. In the second-half, Hereford made a number of subs throughout to change things about, with Marlon Jackson the first to be introduced during the break, with Bowman making way. The hosts continued to probe Connor's goal with Bruno Dalibard turning a dangerous Aidan Thomas cross behind, whilst from the resulting corner, the Fields' captain number 5 headed over after the ball in wasn't dealt with. Jackson showed good persistence to find room 20 yards out to wrap his foot around the ball and curl just past the post. Clucas sealed the victory mid-way through the half with a well-struck effort; a McQuilkin free-kick was only partially cleared and the former Lincoln youngster hit a crisp left-foot shot which beat Gwynne, despite the 'keeper getting a hand to it. The final minutes of the game saw some fiesty challenges from the home team, with Dalibard and Carruthers the recipients, but Westfields continued to push forward, with number 14 flashing a right-foot shot across the goal and a late free-kick in a good position was lashed over, following a foul from trialist Ashley Sammons. Another solid performance from Martin Foyle's squad; a clean sheet was pleasing but again, the attacking threat is still fairly limited. Trialists Clayton Fortune and Ashley Sammons failed to stand out, although the former was rarely troubled in the first-half. Next up for United is the final pre-season friendly against Bristol City at Edgar Street on Friday evening. Hereford: Connor, Heath (Gallinah), Stam, Fortune (Townsend), Dalibard, Clucas (Carruthers), Evans, Sammons, McQuilkin, Canham (Pell), Bowman (Jackson). Subs not used: Hanford, Watkins. The Bulls won the Herefordshire Senior Cup with a 2-0 win at Westfields tonight. A double from Sam Clucas was sufficient to bring the trophy back to Edgar Street with Martin Foyle giving the fixture far more importance than his predecessor. A first team side lined up for the fixture, bolstered by starts for trialists Clayton Forture and a midfielder called "Sommons" on the teamsheet. Dan Connor, a plucky lad from the depths of Ireland, also featured in goal. The Bulls are hopeful of a mini-windfall in one of the Conference title sponsor's many tie-in stunts through the season. BlueSq also sponsor the Goodwood Stewards Cup this week, and have allocated a horse entered in the race to each of the 68 sides in the Conf Premier, North, and South. The Bulls have drawn 'Seeking Magic', a horse whose chances appear so slim that BlueSq doesn't list it in the 59 horses currently in the betting for the race. It's last run was as last of nine 11 days ago. The winner that day? A horse called 'Shropshire'. 28 runners will make the Stewards Cup on Saturday, with the winner earning their side £2000 plus the proceeds of a £100 bet at Starting Price, while a further 28 runners will get a place in the Sprint Stakes for a chance to win £1000 plus the proceeds of a £100 bet. Port Vale's takeover will be completed today, or the Administrator will move to 'Plan B'. Administrator Bob Young has told bidder Keith Ryder his bid must be approved by the Football League today or he will turn to a second bidder waiting in the wings. Ryder has maintained that his bid would be completed by the end of July. 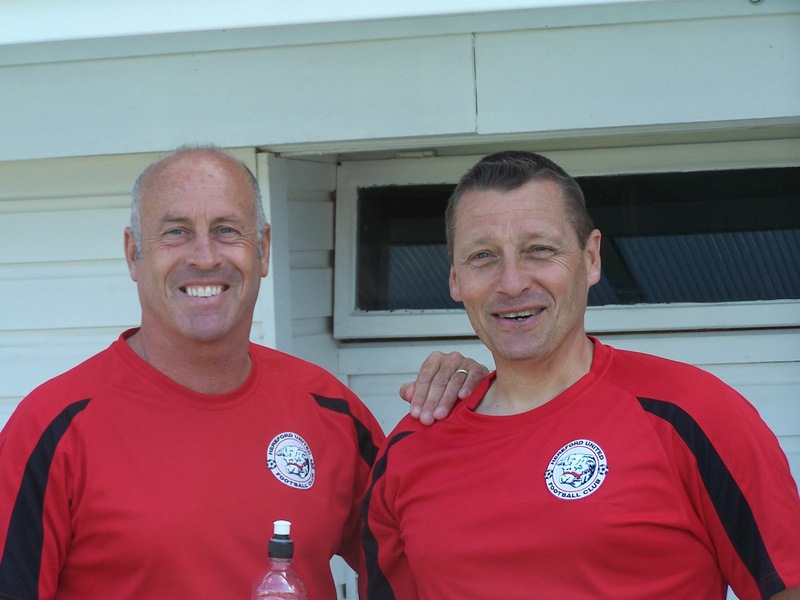 The Valiants have added former manager Dean Glover to their backroom staff as a youth coach. Luton are hoping to offload midfielder Andre Boucard to Notts County. The former York and Kettering man cost them £25,000 in January but he made only a handful of appearances and is deemed surplus to requirements by Paul Buckle. Newport are in talks to sign keeper Lenny Pidgley on a short term deal as cover for injured no.1 Alan Julian. The former Stevenage man is expected to miss the opening weeks of the campaign after being injured in his debut for the club. Portsmouth are now down to three senior players after Kanu walked out under freedom of contract after serving a 14 day notice period. Despite effectively tearing up the final year of his contract, the Nigerian still has a claim lodged with the Football League for £3million in unpaid wages that is large enough to scupper any rescue bid for the club. Administrator Trevor Birch is hoping the FL decides on his claim before the start of the season. Lincoln boss David Holdsworth has expressed his surprise that former Imps keeper Scott Loach was sold to Ipswich by Watford for just £200,000. The Imps bagged just £20,000 as their sell-on clause rather than an expected £150,000, with Holdsworth calling the sale 'a bargain'. Meanwhile, their Sincil Bank stadium draw raised just £21,000 when they budgeted £50,000. Fan group The 12th Imp won the draw. Luton have confirmed the signing of keeper Dean Brill on a two year deal after a successful trial. The 26 year old has over 200 senior appearances to his name since coming through the Hatters' youth side. Lincoln have transfer listed former Bulls loanee Josh Gowling. The former Bournemouth and Gillingham defender is reported to be one of their highest earners. Telford have signed forward Kieron St Aimie on contract for next season. The nomadic 23 year old, who can play up front or on the wing, spent last season with Tamworth but had a number of injuries in the second half of the season. Macclesfield have signed Fleetwood defender Kieran Charnock on loan until January. The 27 year old previously played for Morecambe and Northwich. Hereford United make the very short journey across the city to play Westfields FC in the final of the HFA Senior Trophy tomorrow evening, kick-off 7pm. Westfields chief-executive Andy Morris is hopeful that a good crowd will watch the Counties two top teams battle it out for the trophy. "We are looking forward to defending the HFA County Senior Invitation Trophy having beaten Hereford United at the allpay.park last season when a late goal from Sam Harrison gave us the trophy for only the second time in our history," Morris told BN. "However we expect the new management team of Martin Foyle and Andy Porter to bring a much stronger side to the allpay.park for tomorrow's night's encounter and we shall be looking forward to a good attendance given the Bulls' currently being un-beaten in their run of pre-season games." The Bulls have a new back of shirt sponsor for the next two seasons. When I heard about M & M not renewing the shirt sponsorship, I made some enquiries and quickly agreed a 2 year contract with the option to extend in year 3. As a lifelong Hereford United supporter, first coming to Edgar Street in 1980, this was an extremely proud moment for me to help support the club I love. If I, coupled with the support of everyone connected with the football club, can raise the profile of C2 Recruitment and grow the business in the next 2 years then I will be in a position to financially support the club going forward which is what I want. I have had the pleasure of meeting the chairman, the Board and people who work for the club recently and I have to say I have been really impressed. Morale is high and everybody is optimistic about the future and I hope I am not tempting fate but the good times could be coming back. I spoke with Hereford legend and my boyhood hero Chris Price on Saturday and he said it seems like a different club now to the last few years. I think he is right. Shane has been making the regular trip down the A49 to stand on the Meadow End, but intends to move to the stands this season and start bringing his three year old son, Oscar. Dartford have announced the signings of Mark Arber and Nathan Collier for the coming season. Veteran defender Arber, 34, has had long spells with both Barnet and Dagenham, while right winger Collier, 26, joins from Hampton and Richmond. Darlington are expecting their first game of the season, away at Bishop Auckland, to be a sell out after already selling 1,300 of the 2,000 capacity. Newport have added lottery millionaire Les Scadding to their board. The local won £45million in 2009 but says he is not there to be a sugar daddy to the club. Portsmouth are down to just four senior players after more were moved on last week to ease their wage bill. Tal Ben Haim's agent says the club are £250,000 short of agreeing a deal to settle his demands, but Kanu's agent is still holding firm with just 12 days left before their August 10th deadline set by the Administrator. Former Bulls trialist Dan Smith lined up for Weymouth as they faced Bristol City at the weekend, a game in while ex-Bull Alex Jeannin also featured for the Terras. Lloyd Macklin was a second half sub as Torquay faced Leeds on Friday. Former Bulls loanee Sam Winnall is on trial at Preston. The Wolves youngster was a second half sub as the League One side played AEK Athens at the weekend. Telford boss Andy Sinton expected to complete the signing of former Bulls trialist Jonathan Brown in the next couple of days. The former Southport winger ended last season on loan with the Bucks and played for them on trial at the weekend. Lincoln have signed teenage Birmingham defender Graham Hutchinson on loan until the January transfer window. Gillingham have been found guilty of sacking former player Marc McCammon because of his race. An employment tribunal has declared that the striker was victimised because he was black, with the club issuing a statement saying they are 'staggered' by the decision and are considering their next course of action. Southport have confirmed the signings of striker Steven Tames from Prescot Cables and defender Chris Lynch from Stalybridge. Stockport have signed defender Jordan Fagbola after he was released by Rochdale. The 18 year old was released without making a first team appearance. Lincoln have signed keeper Jake Turner on a deal for the coming season. The 19 year old was released by Scunthorpe in January after coming through their youth side. BN is pleased to announce that £25,000 was raised for Macmillan Cancer Support from the car park at this summer's Hay on Wye festival. The proceeds, which will be spent locally, will be presented to a representative of Macmillan at a date to be confirmed. Everton coach Alan Stubbs believes his team yesterday should have done better against such lowly opposition. He told Everton's official site: “They looked to stifle us but we have to be better than that. We have lads who have been training with the first team and are looking to progress in the game. “If they are then they need (to improve) as, no disrespect, but Hereford are a Conference team. We need to be better and if we are not then we will address it and they have been told that." 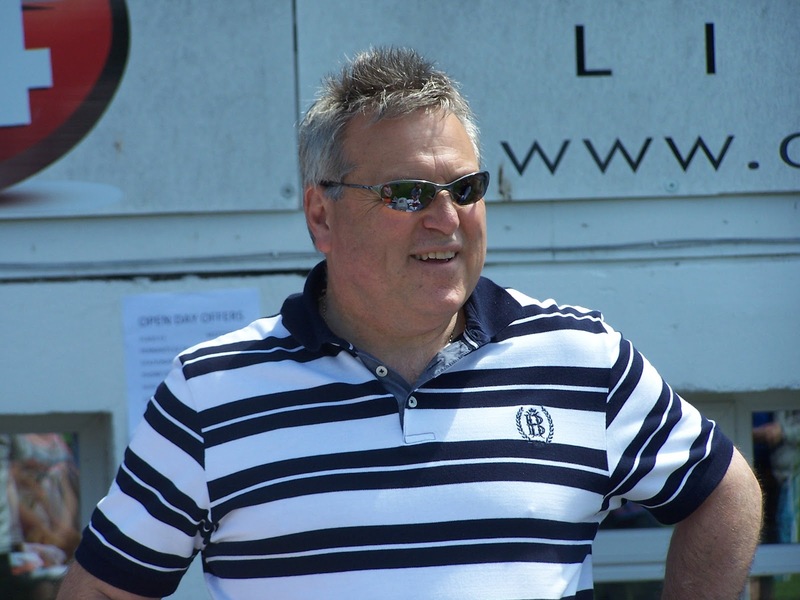 Conference sponsors Blue Square's foghorn Alan Alger has predicted the Bulls will finish between 9th and 12th for the coming season. In his piece with the Non-League Paper, Alger says he is impressed with Martin Foyle, and that the Bulls 'will cope with relegation better than most'. He expects the 9th-12th places to be between the Bulls, Cambridge, Newport, and Macclesfield - saying opening day opponents Macclesfield's signings 'are solid rather than outstanding'. Meanwhile, the paper reports that former Bulls trialist Eddie Odhiambo is training with Conf North side Brackley and considering a move into part-time football after failing to win an Edgar Street contract. Elsewhere, former loanee James Baxendale has joined the growing ranks of ex-Bulls trying to earn a deal at Walsall. Nicky Featherstone is reported to be on the verge of agreeing a deal, while Ben Purkiss, James Chambers, and Paul Downing are also training with the club. This afternoon's friendly against Everton provided Hereford United with a 'good workout' according to manager Martin Foyle. "I thought 0-0 was a bit unfair," Foyle told BBC Hereford and Worcester's Keith Hall. "They had a couple of chances but I thought we had a lot more. "I thought we looked organised, hard to beat. I knew we would tire because we've had a very hard week and I think it showed on some. "The defence has been absolutely spot-on, all of them. "Stef didn't play much of a part today, Heathy trying to play minutes from a long injury, the same with Bruno. They need minutes on the pitch. "It's very hard as I'm trying to work for two weeks ahead but I've got to make sure the players get enough time under their belts." Both Bowman and Carruthers took knocks this afternoon. "Bowman was concussed a little bit. He took a whack and we will have to see the extent of that. "We are still very short on numbers. With one or two injury prone players who haven't played a lot of football, you're really looking at 16. "So I'm looking to bring in probably one or two more at the right time. "Looking at the game on Tuesday at Westfields yes I'll probably bring another three or four in to have a good look at. "We know what our financial restraints are this year and it's going to be very very hard. Hopefully next year will be a different ball game and I can look at things differently. "At the moment things are tight and we've got to get on with it." With hopes of a smattering of first teamers not materialising, it was a young but well-drilled Everton outfit that took to field against Hereford United in this afternoon’s friendly. Martin Foyle gave run outs to most of his squad with Marlon Jackson and Sean Canham starting up top. Hanford retained the gloves behind Heath, Graham, Townsend and Gallinagh with Watkins, Clist, Pell and Chris Curruthers across the middle. An early ball forward was flicked on by Jackson but Canham had failed to anticipate and it ran through to the keeper. At the other end, Francisco Junior lifted his effort from distance well over the bar before Luke Graham showed calmness to shepherd a through ball back to Hanford. Townsend got in some interceptions but his clearances lacked direction and fell to the Everton midfield and when his clumsy challenge on McAleny brought a fee kick, Garbutt put his shot straight into the wall. Curruthers put in a decent cross from the left but when Watlkins headed back across goal, Canham’s header was just wide. Conor McAleny found space in the Bulls’ box but slid his shot wide of the post. Barkley and Forrester both tried and failed to be Hanford before his Everton counterpart was relieved to fall on the ball close to his goal-line following a few moments of panic in the visitors box. Then, as the break approached, Marlon Jackson did well to work some space but his shot was blocked. Bowman replaced Canham for the second period. Curruthers moved to left back in place of Heath with Sam Clucas coming on to fill the wide midfield slot. Bowman was soon into the action showing a clean pair of heels to his marker but his decision to shoot met with little sympathy from Jackson who was well placed for a pull back. Curruthers showed good determination to win the ball high up the field and delivered a tidy cross which Hammer was grateful to clear under pressure from Bowman before Clucas had to be alert to clear off the line as Everton threatened. Jackson and Bowman both had the pace and power to trouble the Toffee’s back division so it was disappointing when the latter took a bang to the face and had to leave the field with what was later described as “a bit of dizziness”. Will Evans came on as a replacement in midfield with Clucas moving further forward and Clist switching to wide left. Harry Pell spotted Jackson’s good movement and his delightful chip put Marlon through but Hammer was quickly across to clear. McQuiklin, on for Watkins, warmed the hands of keeper Mucha before Jackson also tested the visiting custodian with a smart curling effort. Hanford kept out a long range shot from Lundstram but despite a couple of “extra time” minutes from Ref Kevin Morris, neither side could break the deadlock in front of 1100 which included 197 boiled sweets. Bulls: Hanford, Gallinagh, Townsend, (Stam 65), Graham, Heath (Clucas 46), Watkins (McQilkin 75), Pell, Clist, Curruthers (Dalibard 57), Jackson, Canham (Bowman 46 and Evans 65), Unused Feeley, Connor. Everton: Mucha, Browning, Garbutt, Junior, Hammer, Bidwell, Forrester (Long 70), Barkley, McAleny, Hope (Grant 75), Lundstram. Unused Taudul, Touray, Green. Apart from the inevitable disruption of the substitutions this was a fairly enjoyable spectacle. The Jackson/Bowman partnership looks to have legs and it was a shame that Ryan took the knock which prevented him getting the full 45 minutes. B On the plus side, Dodge seemed confident that it was nothing serious whilst also confirming that Chris Curruthers withdrawal was nothing more than “a bit of a dead leg”. Hanford, again did what was required while Luke Graham was the pick of the back line. Marley Watkins worked hard and just needs to create enough space to get his crosses in. Westfields on Tuesday (KO 7.00pm), Bristol City on Friday (KO 7.30pm) then we’re off. Dan Connor and Lewis Feeley were also in the matchday squad. Bittner's absence has meant that Dan Hanford (above) has kept goal in every friendly to date. Whilst some players such as Joe Heath, Benoit Dalibard (pictured with the ball) and Stefan Stam were only given short periods on the pitch, not surprising after their injuries, others such as Simon Clist, Luke Graham, Andy Gallinagh, Harry Pell and Marlon Jackson played the full 90 minutes. One slight worry was a second half injury to striker Ryan Bowman (pictured with Will Evans). He appeared to have suffered a blow to his jaw. Physio Ian Rodgerson also had to attend to Chris Carruthers who looked as though he had hurt his upper leg. Hereford created several chances during the game never really tested the Everton keeper. This one, in the 38th minute, came after a corner. Sam Clucas was alert when he blocked a strong shot with his knees towards the end of the match. The Bulls drew 0-0 with Everton in today's friendly. Stepping up their performance from the midweek match with Gloucester the Bulls pushed their counterparts, many of which had Premier League and International Youth level experience, and were unlucky not to win the game. More information about the decision by Northern Racing to end horse racing at Hereford and Folkstone has been given by chairman Lord Howard. "I'm very sad about Hereford, but there's no doubt about Hereford, there were different stories doing the rounds yesterday but we've been in negotiations with Herefordshire Council for many years," said Lord Howard. "Many people would agree the facilities are not up to scratch, they need substantial investment and you can't expect anyone to make that kind of investment when the lease has only 17 years left to run. "We've been trying to persuade the council to give us a much longer lease without success and that's why we've had to close it down. "It's not a case of if a course isn't making money it will be shut down." 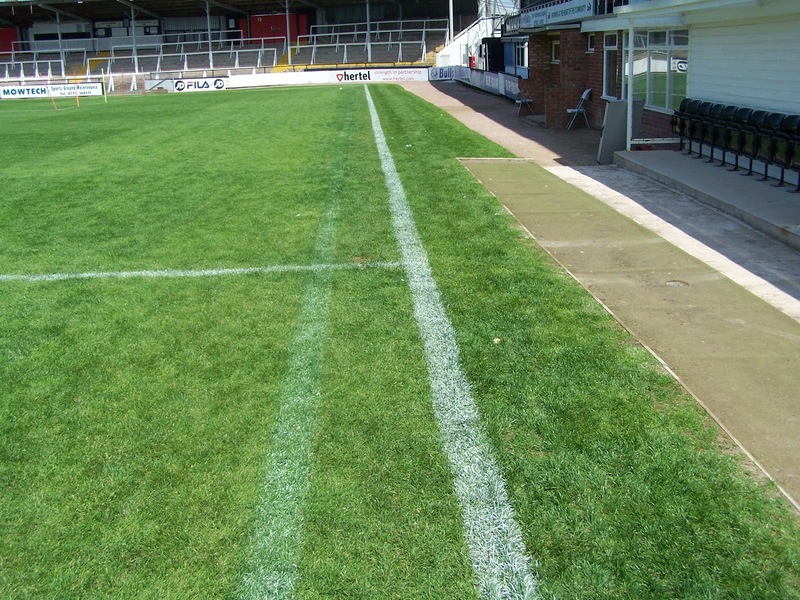 The comments by Lord Howard appear to justify the decision by the directors of Hereford United to obtain a much longer lease from the Herefordshire Council for Edgar Street. As Lord Howard intimated it's difficult to plan for the future without security. However neither Northern Leisure nor the Herefordshire Council have released any details of the discussions about extending the lease and it may well be that the Council believe it can make more money from the large area of land that the racecourse currently occupies in other ways. Nevertheless the closure of the racecourse at the end of the current season is a real blow to the area. Hereford United take on an Everton XI at Edgar Street this afternoon. The friendly kicks off at 3pm. Few, if any, trialists are expected to play a part in the friendly as manager Martin Foyle now has 18 players in his squad. However he may still be hoping to sign another striker, possibly on loan. With two weeks to go to the season opener, Martin Foyle has hit the 18 man mark he intended to sign up for the coming season. That was the budgeted figure he was planning to work with although it is unclear whether he has actually exhausted his budget or that, even, if further funds have been sourced. There could yet be up to £50,000 coming from the sale of Mathieu Manset to the Swiss club Sion. While the fee remains undisclosed, well placed sources are putting a £750,000 value on the move. However, similar claims were made about his loan to China that proved to be false. Season ticket sales are also reported to have been encouragingly strong, with a good number sold after the early bird discount period ended. Meanwhile, Premier Sports have taken the odd move of going back in time to advertise the Bulls' opening match with Macclesfield. The picture they have chosen to illustrate the event is from a previous televised tie at Edgar Street - in 1999. On that day, the Bulls beat FA Cup opponents Hartlepool 1-0 with Rob Elmes scoring the goal. Bulls' physio Ian Rodgerson was on the bench. Hereford Racecourse is set to close according to the operators. "Hereford is owned by Herefordshire County Council and run under a lease arrangment," said Tony Kelly, managing director of Arena and Northern Racing. "Attempts to extend the lease, which has 17 years remaining, have been unsuccessful. "Despite being unviable for several years we have supported the racecourse, but much-needed investment, required to breath new life into the racecourse, cannot be justified in the absence of a long-term future for the business." Hereford Racecourse was opened in 1771. Herefordshire Council deeply regrets the decision that Arena Leisure and Northern Racing has taken today to close the Hereford Racecourse. At midday today representatives came to see us to inform us of their decision to close. This is the first we heard that they were going to take this decision. The lease between the council and the racecourse has a further 17 years to run and the council remains willing to discuss options with the company for the continuation of racing in Hereford. This is clearly a business based decision for Arena Leisure and Northern Racing. We understand in discussion with them today that they have been running at a loss over recent years and their announcement and decision to close Hereford racecourse is based on their overall trading position. Later Council Leader John Jarvis was asked by BBC Hereford and Worcester whether the Council might reduce the rent on the course which has happened at Worcester. "There has got to be a good business for us to do that because we have a responsibilty to make sure the assets of the people of Herefordshire are well looked after. "I will look at it." Jarvis also told the station that the Council knew nothing about the closure until mid-day today. "At 12.00 o'clock, some people came to see me and broke the news to us which was a big shock indeed. "We haven't had talks with them since last year." Walsall have confirmed the signing of former Bulls loanee Febian Brandy on a one year deal. Now 23, the former Man Utd trainee has had a nomadic career since leaving the Red Devils following his Edgar Street stint, where he scored four times in 15 games for the Bulls. Former Bull Gareth Sheldon is on the move again, signing for Midland Combination side Bolehall for a second time. Lincoln have loaned out teenage keeper Nick Draper to Sheffield FC for the coming season. The 19 year old is unlikely to be in the first team picture at Sincil Bank this season. Luton are set to complete a deal with trialist keeper Dean Brill. The 26 year old has played for Barnet and Oldham since leaving the Hatters following their relegation to the Conference. Ebbsfleet have announced they have resigned striker Liam Enver-Marum just a month after he agreed a short term deal with Stevenage. He scored 13 times for the Fleet last term before trying his luck with the League One side. Cambridge defender Jonathan Thorpe will miss the opening weeks of the season after he required surgery on a knee injury. The 19 year old will miss up to two months. Lincoln have signed midfielders Daniel Gray and Geoffrey Gouviea on one year deals. Gray, 22, was released by Chesterfield in the summer, while Gouviea, 21, comes from his native US through his dual nationality Portugese passport where he has been playing in the amateur leagues. The Bulls have confirmed the signing of Marley Watkins on contract from Bath City. With the two clubs failing to agree a fee, the matter will go to a tribunal with Bath having had the player only since January 2011 following his release from Cheltenham. The 21 year old made 30 starts and nine sub appearances last season, netting five goals. His arrival takes the Bulls' squad up to the 18 players originally indicated by Martin Foyle to be his budgeted figure. The Football League has released a lot of information about attendances over recent seasons. Here's a look at Hereford United. On the day the Bulls' official website gets a makeover for the new FL Interactive styling, Torquay's press officer has taken a shot at the new designs. In a lengthy piece, which writer Tim Herbert doubts will be read as few can access the site since the redesign, he says the site is 'beset by bugs, glitches, and faults' and that the new style meant that the website's 'reputation had been smashed'. On the Torquay website now, the original article has been replaced acknowledging a request from the Football League to remove the article. The new article expects the FL to issue a statement absolving clubs of blame and acknowledging what has gone wrong with the change. New Bulls arrivals Marlon Jackson and Ryan Bowman have both been quoted for the Top Scorer market by Conference sponsors BlueSq. Jackson is a 40/1 shot after originally opening at 66/1, with Bowman coming in at 80/1 after netting 7 times in his last 14 games for Darlington last term. Sean Canham is the only other Bull currently on the list, with BetVictor offering 50/1. The Bulls remain 25/1 to win the Conference, and 12/1 for promotion. Cambridge have taken on former defender Adam Tann as a youth coach at the club. The 30 year old will combine duties with the U's with playing with Conf South side Chelmsford. Kidderminster have signed defender Keith Briggs for a second time. The 30 year old left the Harriers for Fleetwood last summer after a year at Aggborough, but was released midway through his two year deal last week. Truro have been given six weeks to clear their latest debts, with the court being told they have accrued more tax debt since the latest demand. They were back in court to face claims for more than £700,000 after two firmed 'took over' the winding up order originally brought by the taxman over a £51,000 sum that was subsequently settled. The court was told that the club had racked up another £15,000 in unpaid tax since the last court date. Mansfield are trialling forward Ryan McGorrigan. The 19 year old was released by Newcastle earlier in the summer after a handful of appearances in their reserve side. Walsall are expected to sign former Bulls loanee Febian Brandy after a brief trial. The diminutive striker started 2012 in Greek football but left without making an appearance for Panetokilos. Former Forest Green secretary, and Conference board member, Colin Peake has agreed to work with Gloucester City as a 'consultant'. He will assist the club in their return to Gloucester and the new ground. Former Bull Nick Chadwick has been given a let-off after being told his red card for Plymouth against Yeovil will only incur a one match ban - and that ban can be served in their next friendly game. Wrexham CEO David Roberts is to leave the club at the end of the month. The Chartered Accountant has been doing the role on a voluntary basis for the last six months. Woking have signed Aldershot striker Bradley Bubb on loan for the coming season. The 24 year old has failed to adjust to the Football League since being prolific with Farnboro. David Moyes, the Everton manager, is expected to give several of his first team squad at least sometime on the pitch at Edgar Street on Saturday. After their trip to Java was cancelled, Moyes needs match practise for his players and the trip to Hereford and another to Tranmere next Tuesday could give him that opportunity. Instead of facing a Malaysian XI and another side in the next few days, Moyes is expected to deploy a number of first team players in reserve team fixtures against Hereford United on Saturday, and Tranmere Rovers in the Liverpool Senior Cup final at Prenton Park next Tuesday, in order to build on their pre-season fitness. Anyone visiting Edgar Street recently must have noticed the former livestock market site, just opposite the football ground, is fast becoming even more of an eye-sore than it was when it was operational. The area around has been boarded up and even the pavements rendered unusable. Yet nothing appears to be happening on site fueling speculation that there is a problem with the 'deal'. According to the Hereford Times, developers Stanhope will only say the 'legal issues' are delaying the redevelopment. But there is a worry that agreements with the likes of Waitrose to take space on the site may be in jeopady unless progress is made sooner as opposed to later. Meanwhile this delay could, no doubt, have an effect on Hereford United's plans to redevelopment both ends of the football ground. The club needs income from such projects to help balance the books. Hereford United will launch its new look website tomorrow (Thursday) according to Mark Farmer, one of its contributers. The site will have several new features and should be easier to navigate. And to promote the launch, readers will have a chance to win a new Ipad. Lincoln have signed defender Tom Miller. The former Norwich and Rangers 21-year old has penned a one-year contract. Ebbsfleet midfielder Neil Barrett has signed a year-long extension to his contract. Newport County have added to their strike force with the capture of former Luton man Aaron O’Connor with his Hatters contract being terminated by mutual consent. Grimsby have signed keeper Greg Fleming, who last season played for Chesterfield in the Football League. 25-year-old Fleming will compete for the No. 1 jersey with last year's ever-present James McKeown. Adam Bartlett’s Gateshead team went down 2-0 to York City last night at the International Stadium. 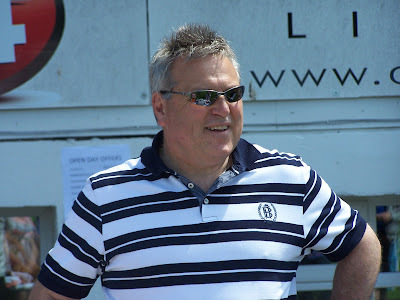 Manager Ian Bogie remains unimpressed by his teams build up to 2012/13. AFC Telford played out a goalless draw with Walsall who included trialist Febian Brandy in their ranks. Brandy is reported to have completed a medical at The Bescot earlier in the day. Stockport County held Fleetwood Town to a 0-0 at Edgeley Park while Macclesfield also drew at Witton Albion. Hereford United manager Martin Foyle said he was a 'little bit disappointed' with certain aspects of the performance of his squad during last night's friendly against Gloucester City. "Decision making was poor, passing was a little bit slow. "One or two were trying to do a bit extra on the ball and didn't get the play flowing. "There's a lot of work to be done. "I'm not going to hide from the fact that we need to improve a fair bit." On trialists Foyle said that the club were talking about a deal with Bath over winger Marley Watkins. "He's down as a trialist until we agree some contract with him and some compensation with Bath. "It's minimal. But we have got to sort it first." Finally Foyle said that the club had been told that it will be a different Everton side that will play at Edgar Street next Saturday. As reported yesterday, their senior squad's trip to Java has been cancelled. "It's great, that's want we want. We need to be pushed a little bit." Ryan Green to Cypriot Club Olympiakos Nicosia? Cyprus Weekly sports editor, John Leonidou has reported on Twitter that “Welsh defender Ryan Green is currently on trial at Olympiakos Nicosia”. The team from the Cypriot capital play in the 23,000 capacity GSP Stadium and are currently managed by former Newcastle United player Nikodimos Papavasiliou. Tonight’s friendly against local side Gloucester City proved to be an entertaining affair, which saw six goals in a 4-2 win for the home side. Martin Foyle gave starts to Joe Heath and Michael Townsend while recent signings Ryan Bowman and Marlon Jackson started up front in a traditional 4-4-2. Jackson was quickly into the action with a surging forward run and shot that was blocked by City keeper Mike Green. At the other end, Hanford was decisive coming for an early cross then a Marley Watkins cross from the right saw Clucas’ shot on the volley turned away for a corner. From the flag kick, Simon Clist’s teasing cross deceived the keeper and curled in at the back post to open the scoring. The City side were soon on level terms however when Edwards was hauled to the ground by Heath (or was it Clist) and Edwards got up to send the spot-kick past Hanford. Heath while under pressure dealt with a good cross from the Gloucester left. After a scrappy ten minutes or so The Bulls started to take control and a long ball forward was won in the air by Bowman who quickly followed his own flick-on to get a shot on goal but Green was down to block and gather at the second attempt. Bowman got his reward a few minutes later when he got on the end of a Jackson flick to fire home from the edge of the box. The Bulls added to their lead as half time approached. Sam Clucas guided a header into the path of Jackson and the former Bristol City man showed good pace and technique to finish from 15 yards. Sam Clucas fired just wide from 35 yards while Hogg struck the foot of Hanford’s post with a rasping 20-yarder. The City side got their second just before the break due largely to some slack marking at the back. Townsend was nowhere near Adam Mann who was allowed time to drill home past Hanford. The second period saw the usual pre-season flurry of replacements. Harry Pell joined the fray and showed a far greater interest in proceeding than he had done at Worcester on Saturday. The entire back four was replaced to give opportunities to Bruno Dalibard, the impressive Luke Graham, Will Evans at right back and a player believed to be Clayton Fortune the former Bristol City centre backhoe spent last season at Aldershot. Mann brought a fine save from Hanford then the Hereford keeper was on his toes to tip a looping over the bar. McQuilkin threaded a ball through to Bowman who guided it forward to Sean "The Hitman" Canham who bundled it over the line at the second attempt. McQuilkin, sporting a new-season haircut crashed a 25-yarder off the crossbar before a couple of late-ish challenges from the visitors slightly spoilt what had been a sporting and largely entertaining 90 minutes (plus a bit) for the 338 who bothered to attend. It appears to be coming together and with, maybe, a couple of late additions this week Saturday’s Everton game could be well worth watching. Hereford United defeated Gloucester City 4-2 in this evening's friendly at a very warm Edgar Street. Only 338 watched the game including 28 in the away end. BN apologies that there were no updates from the game this evening. Bobo (Martin Watson), who usually does them, has had an unexpected couple of days in hospital. Everton have pulled out of the Java Cup after failing to receive assurances about the competition which was due to take place in Indonesia later this week. An Everton reserve squad is due to play a friendly against Hereford United on this coming Saturday. Whether this squad will now contain some first-team players remains to be seen. "The first team squad will now stay in the UK and continue their pre-season preparations," says the Everton OS. Former Bulls' loanee, Kern Miller, has joined up with Boston for the coming season. Gateshead manager Ian Bogie appears to be loosing patience with some of his lethargic under-performers issuing a “Shape-up or Ship out” warning. Bogie was very disappointed with the pre-season match against Blyth Spartans. Wrexham have added former Tranmere keeper Andy Coughlin to their squad for the coming season. The 19-year made his Prenton Park debut last season but was not offered a new contract at the end of his first year as a pro. Former Bulls' trainee, Alex Sykes, is to continue to manage Evo-Stick Division 1 South and West Club Bishops Cleeve for the 2012/13 season. A Hereford United supporter will set foot on Edgar Street this evening, not for the Bulls but for the Tigers. 19 year old defender Sam Rawlings used to watch the Bulls with his Dad but last summer he joined Gloucester City who travel to Hereford for this evening's pre-season friendly. "I watched them a lot last time they were in the Conference," Rawlings told the Citizen. "They finished second a few years running so it was a relief when they went up. "Lots of my mates are Hereford fans and they're coming to watch the game so it would be great to get a win. "I've not played at Edgar Street since I was little. I played there for the under-nines and under-tens but I've never scored there so that's something I'd love to do." Meanwhile the friendly will give Martin Foyle another chance to look at a handful of trialists. Reports on BN and the HT that the Hereford manager had made two signings yesterday later turned out to be incorrect. It's now thought only Ryan Bowman has signed. This evening's game kicks-off at 7.45pm. HUISA, the Hereford United Independent Supporters Association, has cut the cost of membership from £15 last season to just £10 for this season (£5 for concessions). They have given two reasons for the cut. Firstly the economic climate and secondly the rule that 'groups' had to charge £15 for membership has been dropped by the club. That rule was introduced several seasons ago by then chairman Graham Turner. By joining, or continuing to be a member of, HUISA, members receive 10% off purchases in the club shop, £2 discount on all away travel and priority for match tickets. HUISA helps the football club with a regular donations mainly as a result of the very successful 50/50 draw which takes place at every home game. To join HUISA please speak to a committee member or contact the club for a membership form. Meanwhile the HUISA AGM will be held at Radfords at 12noon on Saturday August 25th. Former Darlington striker Ryan Bowman has confirmed that he has signed up with Hereford United on his Twitter. Bowman started his career at Carlisle in 2009 before a loan spell at Workington the following year. Following his release from Brunton Park, Bowman joined Darlington where he made 40 appearences, scoring ten times for a team who were relegated from the Blue Square Premier. Standing at 6 foot 2, Bowman has a good physical prescence and he linked up well with Marlon Jackson in the first-half against Worcester on Saturday. No details as of yet about the length of the deal. A documentary featuring Hereford United is set to air on Sky Sports from the week commencing the 13th August. The show follows the ups and downs of the Football League last May, where Hereford were relegated despite their 3-2 victory over Torquay at Edgar Street on the final day. Featured in the show are big Hereford United fans Tim, and his son Tom Burrows, who was put in touch with the show through Bulls News contributor Bobo. Tom is currently studying journalism at Gloucester University, and has been involved with Bulls News in the past, along with the official website. Sky were impressed with the father son angle which led to Tim becoming involved with the program. Footage shot of the Meadow End and Addisons will be included in the documentary, along with interviews with Tim and Tom. Tim is said to be regretting his decision to wear his 'Bullieve' t-shirt, stating that it's "unlikely to be too flattering!" The first airing is expected to be at 6pm on Monday 13th August, although we are awaiting official confirmation of this. Keep an eye on Sky Sports News in the week leading up to the show, as it's expected that both Tim and Tom will be interviewed. The Hereford United Vice-President's club have announced their committee for the coming year. Other Committee Members: Will Hale, Ron Parrott, Keith Eveleigh, Richard Howard, Keith Dodd and Pete Nicholls. Meanwhile work continues on the VP club room at Edgar Street. It's hoped that it will be ready for the first game of the season on Friday August 10th. Finally the VP's are looking for new members. Anyone interested please get in touch with one of the committee. The benefits of membership include half-way line seats, own lounge and admission to every game. Costs: £505 for an adult, £960 for a couple and £425 for a concession. The pitch at Edgar Street will be a little bit wider for the coming season. It was narrowed after a previous manager thought he didn't have the suitable players to cope with what was one of the wider pitches in the Football League. The new management team of Martin Foyle and Andy Porter have taken a different view and the pitch will be a couple of feet wider. A few more pictures from yesterday at Edgar Street where a game of football was played between some supporters and some legends. 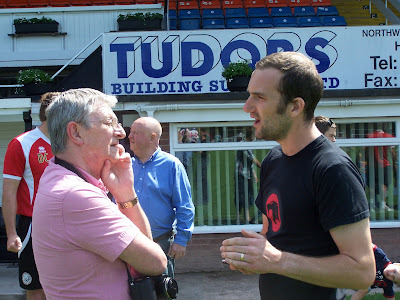 In order - Rob Elmes being interviewed for the Hereford Times by Paul Rogers. Matt Clarke having a few words with Keith Hall. BN's Chris Powis and Jamie Griffiths from the OS. Director Nick Nenaditch who commented " Very enjoyable and sunshine!!" Macclesfield have added to their squad with the signing of left-sided defender Craig Braham-Barrett following a period on trial at the Moss Rose. The 23-year old played under Silkmen boss Steve King at Farnborough. Newport County are expected to announce two signings within the next twenty-four hours. Striker Aaron O'Connor, formally at Grays and Ru$hden together with Mike Flynn who has spent time recently at Bradford City are the two poised to ignite the willy-waving at Rodney Parade. Former Fleetwood striker Danny Rowe has joined Stockport County following an earlier loan spell. The 21-year old has promised them twenty goals by Christmas. Meanwhile, County lost their pre-season game at Halifax 2-0 in what has been reported as a woeful performance. Ebbsfleet have named the Stonebridge Road terrace after manager Liam Daish. Among the weekend’s pre-season matches, Adam Bartlett’s Gateshead side drew 1-1 with Blyth Spartans while a youthful Grimsby side beat Northern Counties East league side Winterton Rangers by the only goal of the game. Luton scraped a 7-2 win at AFC Dunstable. According to Colin Leyland, the vice-chairman of Worcester City Football Club, there were a 'few idiots' amongst the Hereford United support when the two clubs played each other in a pre-season friendly last Saturday at St George's Lane. The game was held up during the first half by the referee. "A few idiots were there to cause trouble, not watch the football," Leyland told the Worcester News. "Some damage was caused to the hordings and the referee had to stop the game because they were on the pitch. "It was supposed to be a friendly match so it's a shame it happened. Thankfully the second half was peaceful." According to the paper police ejected 'several away fans' and one was arrested after a steward was punched in the face.